Along with being a pipe organ builder and technician, I have also been employed at The Forest Hills School District in Sidman for 29 years as an English Instructor with a duel certification in music. This school year of 2010 - 2011, we have been building a 4-1/2 rank tracker organ to be used for instruction as well as performance. The project originally involved 3 ninth grade apprentices in coordination with their Gifted Program advisor, Mr. Pat Kovalsky and the Wood Shop and Technology instructor, Mr. Kevin Lang and principal, Mr. Ray Wotkowski. As the year progressed the four 8th grade gifted students became involved as well. Although we had discussed an organ building project for several years, the catalyst for the project was when Irv Lawless and Assoc. of Greencastle, PA made a 1909 Moller tracker organ chassis available for free. The challenge for the students was redesigning the instrument making it mobile as well as small enough in dimension allowing it to fit through classroom doors. The project has attracted the interest of the entire school and community and beyond. In May we were graced by visits from IUP and Duquesne University graduate students and organ professors including the esteemed Dr. Ann Labounsky of Duquesne Univ. of Pittsburgh PA. . 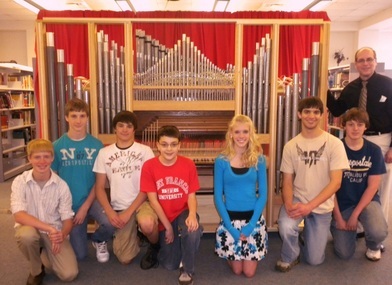 Although far from finished, the organ made it first public debut on May 23, 2011 as part of the spring chorus and band concerts. Completion was scheduled for the fall of 2011, but has been delayed contingent upon a move to a new junior/senior high school building scheduled to open in 2015 . A photo chronology can be found through the Facebook link.